Lionfish are an invasive species to the US and are caught by spear as well as incidentally as bycatch from the spiny lobster trap fishery. 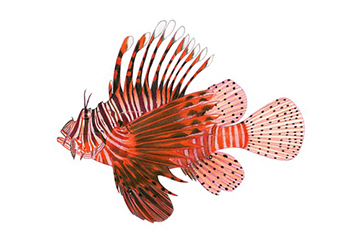 The promotion of lionfish consumption began in 2010 as a means to control the invasive population. In 2011, 128 lbs of lionfish were caught in Florida. Landings have increased to 12,227 lbs caught in 2013. The majority of lionfish were caught in traps. Characteristics which help lionfish in their expansion include being habitat generalists, efficient and broad predation with high competitive ability, defensive venomous spines which means they have few predators, and cryptic colouring and behaviour. Efforts to reduce the lionfish population are underway as damage to native species and coral reefs may be irreversible if not prevented early on. Lionfish are managed under multiple control plans from local, state, federal, and international partners. No fishery management plan exists, but a National Invasive Lionfish Prevention and Management Plan was launched in the spring of 2015 by the Aquatic Nuisance Species Task Force. NOAA’s National Marine Sancturaies Program and the National Park Service have also developed response plans to the invasive lionfish populations. It is thought that the population has been increasing, although a formal stock assessment is needed. No bycatch is caught from the spear fishery. When lionfish are caught as bycatch in the spiny lobster trap fishery, other bycatch species include white grunts and stone crabs. These two bycatch species are neither overfished nor experiencing overfishing. Spears and traps cause minimal impacts to the habitat. As lionfish are apex predators which have detrimental effects on the native species, their removal from the ecosystem is beneficial.